The brand name 'Calor' was coined in 1934, but the company only became 'official' on 2nd August 1935 when Calor (Distributing) Co.Ltd was formally incorporated. The main product was butane, sold in cylinders to rural homes, but the new business expanded quickly as customers realised its many other uses. Both flexible and portable, bottled gas was ideal for use in wartime and despite various supply issues, Calor went from strength to strength. In 1948 Calor received national recognition when it fuelled the Olympic flame at the London Games. Production was stepped up, transport links where improved and, on 2nd November 1948, Calor became a 'public company' - entering a new phase of its history. A decade later saw the introduction of the first propane gas tanks with opportunities opening up in the industrial market. As the decades moved on Calor was constantly on the lookout for further applications for its increasingly versatile products, producing gas cylinders for the mobile heater market which rapidly replaced the paraffin heater as the nation's number 1 choice for spot heating. The rural domestic market for Calor gas continued to grow. Different sizes of gas cylinders where introduced for the increasingly popular pastime of caravanning and motorhoming, twin cylinder installations for the domestic and static holiday caravan market together with new markets for fork-lift trucks, automotive gas and commercial catering. With the big increase over the last 10 years or so in the use of Gas BBQ's and Patio heating for outdoor entertaining has seen Calor Gas 'Alfresco' gas sales booming. Calor Gas is by far the most well known and established supplier of bottled LP gas in the UK. Over the course of many years the Calor brand has become synonymous with its product, so much so that the two have become almost indistinguishable. In truth Calor Gas is a company name and does not describe the gas contained in the bottle. 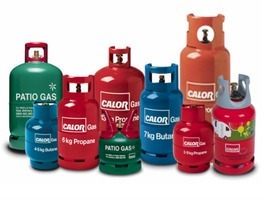 Calor Gas is available in both Propane and Butane designed for various applications. Homestead Caravans have been stockists and Main Dealers for Calor Gas since 1963 with the aim to offer our caravan customers a service for this essential item of caravan equipment. As Calor sales have increased over the years so too have our sales, we keep the full range of Calor Gas cylinders and as well as supplying all the popular sizes for our caravan, motorhome and camping customers, we are also supplying an increasing volume of cylinders and refills for the gas BBQ and Patio Heater market as well as to the portable heater, Tools/DIY, light commercial, mobile catering & Forklift truck sectors. As well as stocking Calor Gas we also hold an extensive range of gas hose, gas pigtails, regulators, caravan bulkhead regulators, automatic changeover valves to suit the Calor Gas range. Calor Gas is available for collection from Homestead caravans 7 days a week.